Following forecasts into a race weekend can be a bit of a nervy exercise, but all weather predictions lined up to give us a great day's racing. Maximum entrant numbers gave the organising committee plenty to plan for in the preceding week, but to have this event appeal so widely is revealing of the resurgent enthusiasm for windsurfing. What was also encouraging to see, was the wide demographic between the youngest and most senior of sailor heading out into wilder conditions on Day 1. 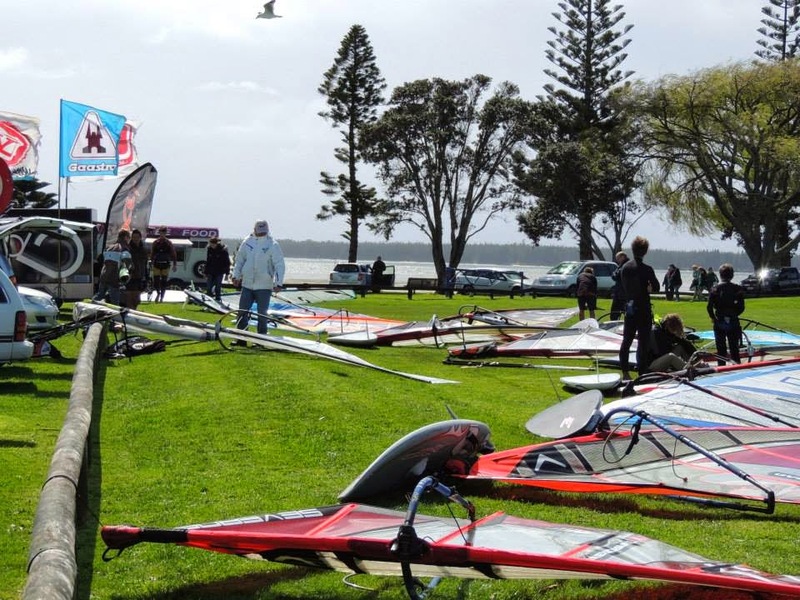 A damp westerly was building steadily as competitors from either end of the North Island rolled into Fergusson Park. 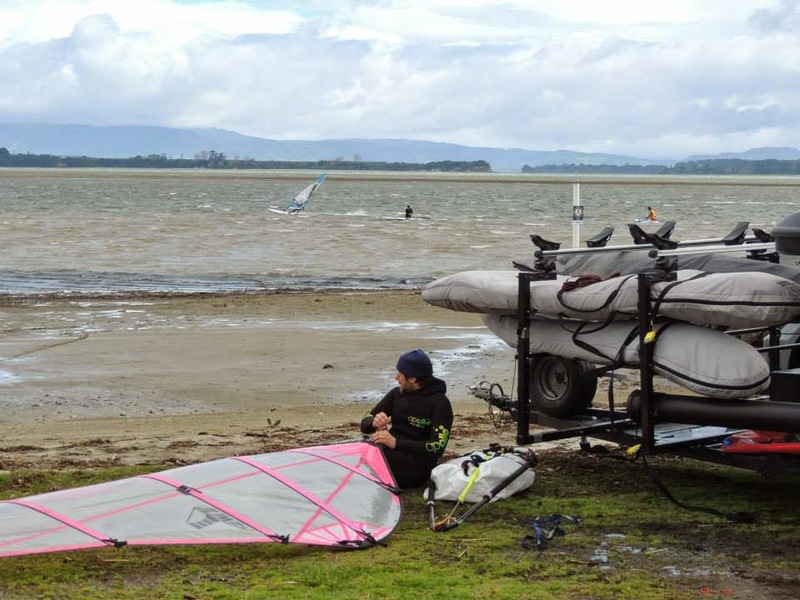 Wayne and the youthful Rotorua crew were rigging, tuning and cruising the channel well in advance of sign-up. A reasonable lead up to hitting the water, allowed plenty of catching-up, new equipment browsing and race strategy sharing amongst gathered competitors. 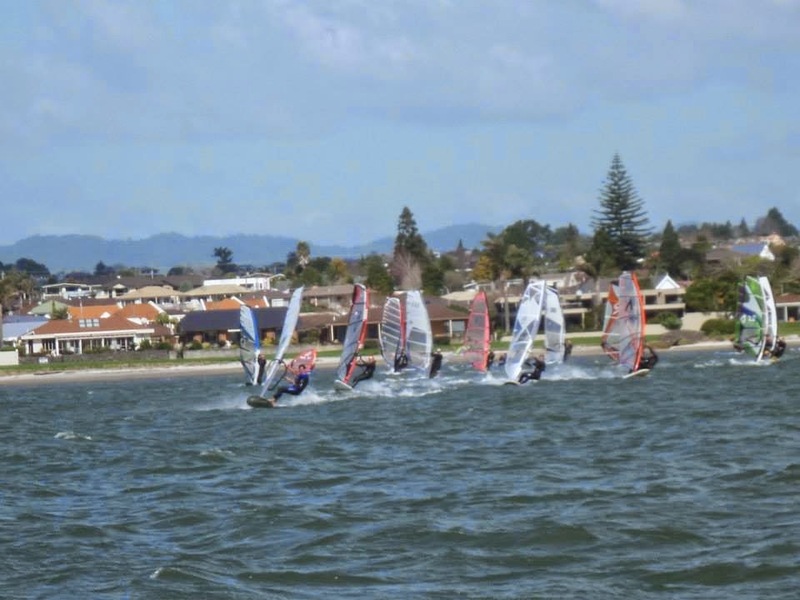 Sailors from as far afield as Wellington and Warkworth were represented, all looking to challenge themselves on a fast/fun windsurf race course,(with some competitors chasing precious NI Cup points). Due to a late afternoon high tide, 3 fleets were decided upon to split numbers on what would be an initially compressed course. After a little buoy maneuvering, racing got underway with some fast, clean starts in all fleets. The lumpy conditions at the marks challenged even the most seasoned campaigner, and some finishing orders certainly indicated what was happening at either end of the flat-out 'blasts' across the channel. Some mid-race tuning of the course was required as significant wind shifts impacted a couple of races, but for the most part we were able to start and complete enough races to get decisive results. *Sunday dawned as a SUP paddler's dream, so an early wrap was called to give traveling participants a good start for home. Laurence Carey continued his outstanding Gold Fleet form across the day, with those in behind all sharing placings. 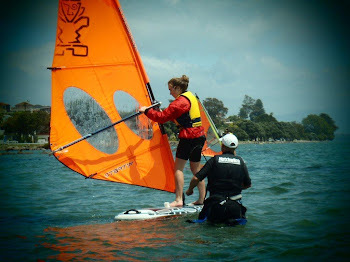 There is simply no substitute for blistering speed and error free sailing on a short course. 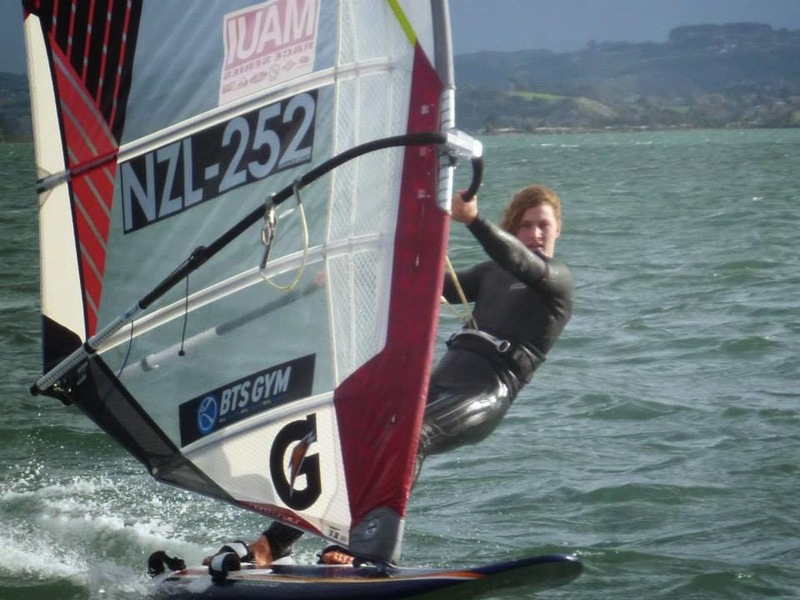 A special mention to Darren Nicholas, who represented Tauranga with some consistent sailing to gain a creditable 4th. The Silver Fleet starts got a little tighter as the number of races ticked over, and confidence built. Race strategies and commitment to fully powered gybes started to emerge in the gusty conditions. There could be cause to promote some of these 'silver foxes' up a Fleet for the next round. 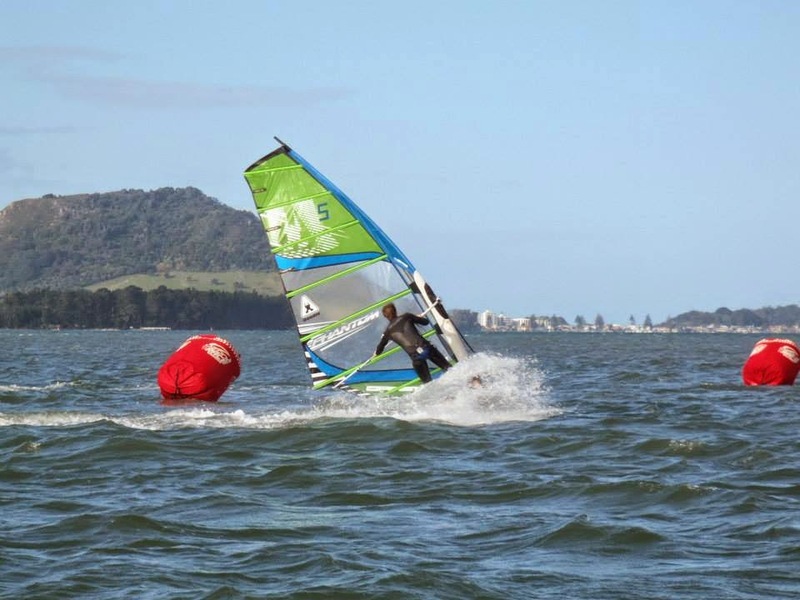 Local sailor, Darryl McConnel came through in the end, to record top spot from Wellington's windsurfing ‘warhorse’, Bruce Spedding. We threw the Bronze Fleet in to the Silver mix, and they certainly showed some great form against the more experienced slalom racers. 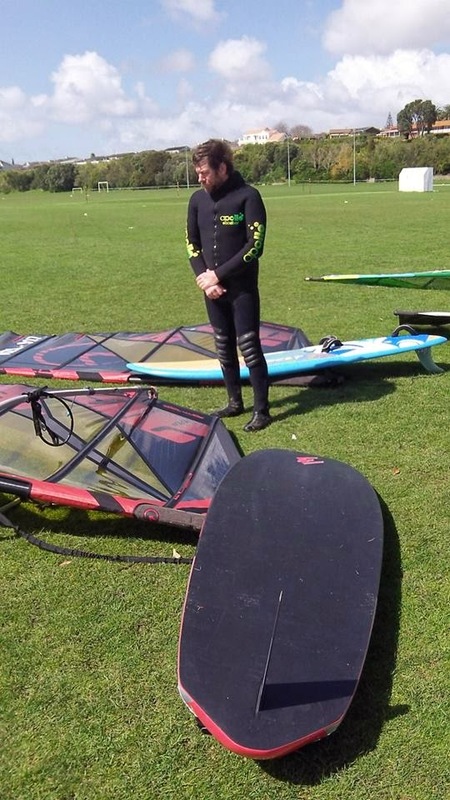 This is definitely the fleet for developing further, there are plenty of recreational windsurfers, (with older kit, and/or creaky bones) worthy of lining up for some of this action. Congratulations to Trevor Kimbler on his well deserved #1 result. Coral represented the woman's division well on some unfamiliar equipment, but once dialed in, certainly showed good board speed through the fleet. This event is certainly NOT exclusive to the podium-chasing racers, but is tailored to suit all those weekend warriors, and recreational fun-boarders with a weekend to spare. 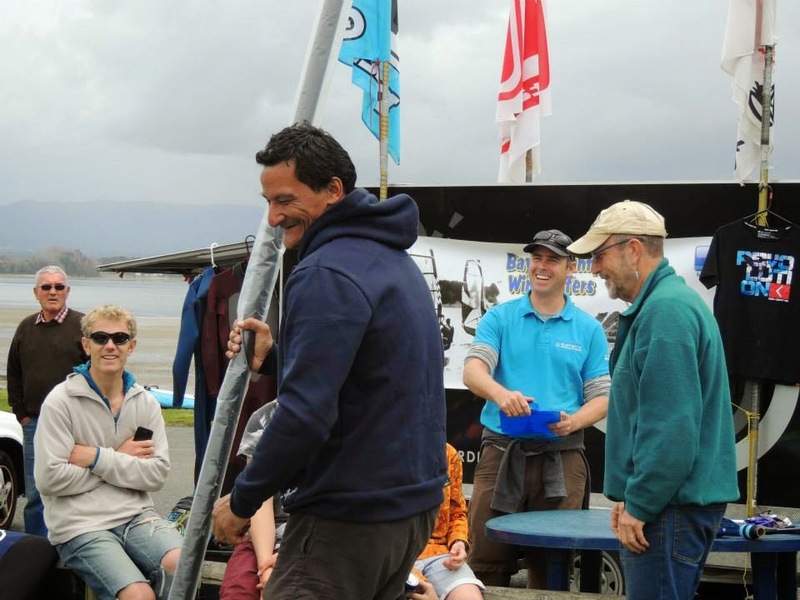 All of the generously provided spot prizes were gratefully received, but the widest smile of the weekend was from Ropata, who scored a new mast,.......and that happy fella is probably still smiling. Barry's Cup was awarded to Darren Nicholas for his excellent result in the Gold Fleet. 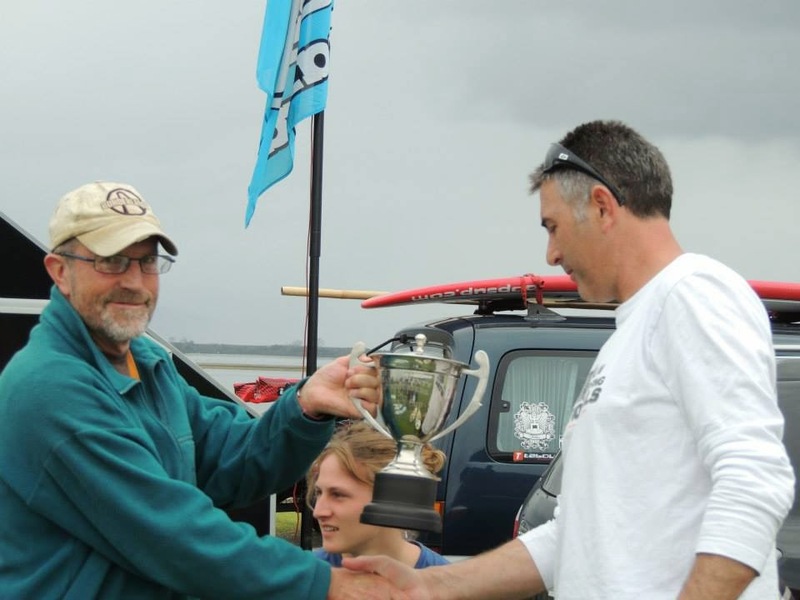 This trophy, (in memory of the late Tauranga windsurfer, Barry Anderson) is presented to the top placed Tauranga sailor. 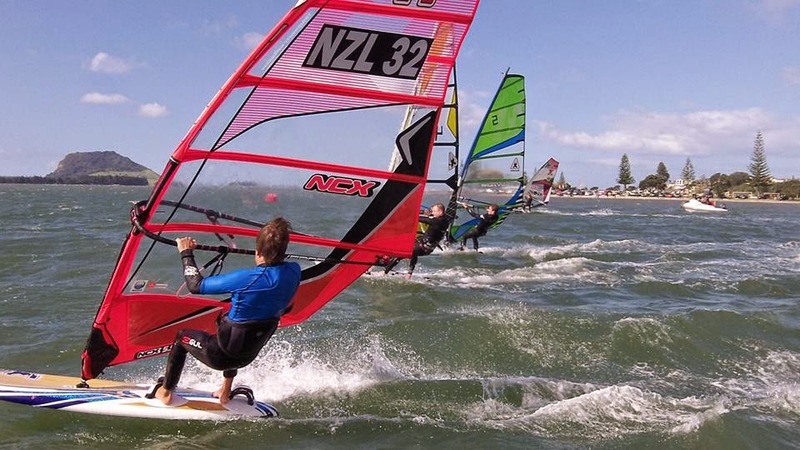 Barry's Cup can be competed for, at any subsequent events contested by 3 or more Tauranga windsurfers. Be sure to check these equipment suppliers out for your next kit upgrade! Wayne checking out kit for the next race day. Marilyn, for assisting with the registrations and administering/generating race results. Christine for her help on the finish line. Ian and Richard for assisting us in the Start and Mark laying boats. Glenn from Assault Boardriders, for providing the highly effective race buoys. Candace from Candy's Coffee Cart, for feeding and caffeinating the crew. Sunlive, for giving the event a great bit of local exposure. ..and President Bruce, for officiating at prizegivng. Peter has to explain rules AGAIN, now with simplified diagrams. 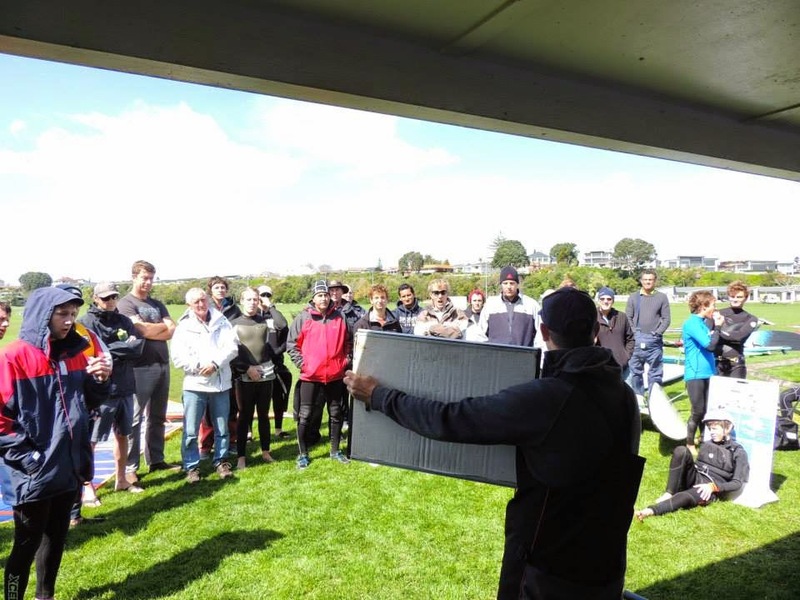 Once again I would personally like to thank Peter Head from Elements Watersports for; not only coordinating another great event, but also facilitating the formal affiliation of Bay of Plenty Windsurfers to Windsurfing New Zealand. 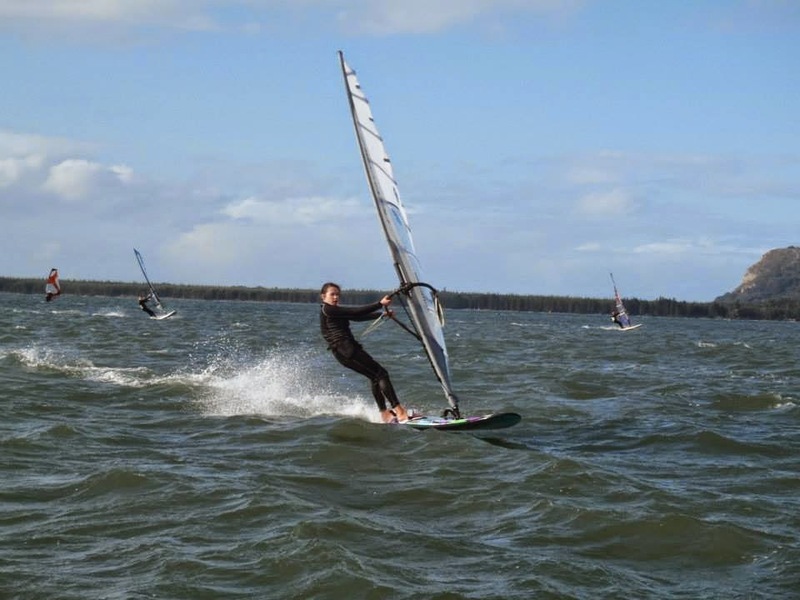 Local participation in windsurfing has increased over the past few years, and we hope to see the interest grow further.